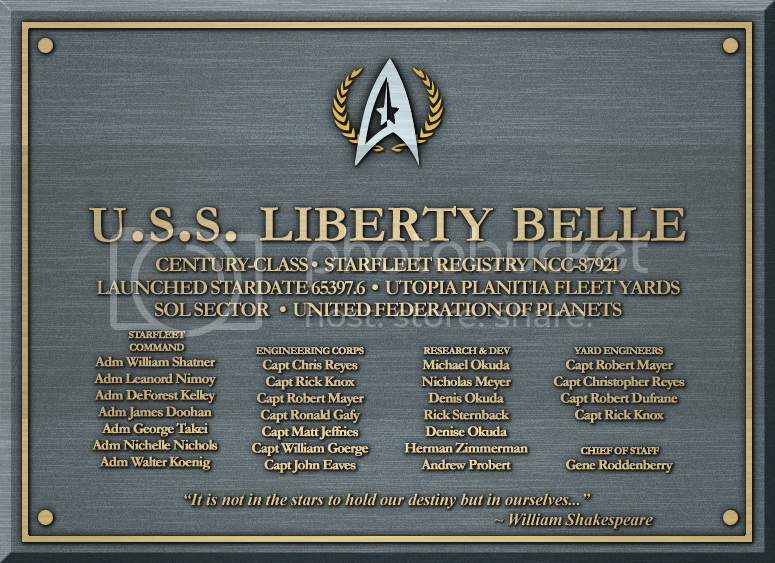 The Liberty Belle has the esteemed honour of being one of the few sims on the internet that follows the course of events depicted in the Destiny/Typhon Pact novels published by Pocket Books over the past couple of years, as most stories set in the Trek universe now work around these particular events. For those who don't know, this is where, in 2381, the Borg launched a massive invasion into the Alpha and Beta Quadrants in an attempt at destroying the Federation. However, after slaying billions, the Borg Collective was consumed by beings known as the Caeliar gestalt, thereby ending the Delta Quadrant menace once and for all. This event led to a cold war-esque period of hostility between the opposing sides, each trying to trump the other in terms of technology, with the Pact sharing a large number of weapons, and the Accords having dominance over the quantum slipstream drive (exploration in the Delta Quadrant becoming more prominent). It is this 'cold war' that the USS Liberty Belle is a part of. Of course, events after 2382 are currently speculation, and are now left to our team of writers to decide. What we do know, however, is that Romulus is no more as of 2387, and what this means for both the Typhon Pact and the Khitomer alliance is worrying, for will these alliances hold out? The Century-class, one of the most recent additions to Starfleet's array of vessels of exploration and scientific discovery, arose out of the Excalibur-class. Early in the 2370s, Starfleet had finally grown concerned enough about the perceived deficit in its range of modern deep space explorers and set the Excalibur's design process in motion. The Constellation was being phased out of service, the Cheyenne, while an effective design, was not devoid of problems, particularly where its structural configuration was concerned, and the Prometheus had been subverted to fill an almost purely tactical role. Even the Galaxy, once Starfleet's bright light, had lost some of its lustre in the alterations required by the Dominion War, repeat Borg incursions and hostilities with, among others, the Klingons. Disaster - at least, disaster insofar as the exploration division at the Advanced Starship Design Bureau was concerned - struck during the Dominion War. Elements of Starfleet, long convinced of the need for an advanced fleet command and control vessel, were vindicated by the losses suffered during the Dominion War when first the Jem'Hadar, then the Cardassians and the Breen exploited the Dominion's technical superiority in field and communications jamming technology to catastrophic effect. Dozens, then hundreds of ships were lost because fleet battles, which could hinge on the transfer of a single command, found the Federation combatants in particular unable to communicate with one another. Something needed to be done and, albeit too late to partake in the war, the Excalibur was repurposed to counter this deficit in Starfleet's tactical abilities. Its role as an explorer was subverted to fill Starfleet's need for a command and control vessel. Gone were the impressive laboratory suites and expansive research stations, the equipment and technology that would have made the Excalibur Starfleet's premier explorer. Some of these were replaced by the ship's communications and counter-communications equipment, exceedingly complex hardware typically only ever found aboard starbases. A fleet command vessel would, by necessity, find itself a target for enemy vessels and, as such, the Excalibur needed to be able to hold its own in any engagement. The most advanced Federation weaponry and shielding of the time were employed, including an impressive torpedo armament that, just years before, would have been considered both impractical and egregious on board a Federation vessel. However, the Excalibur not only needed to be able to defend itself, but it also needed to be able to launch an offensive, much like the Klingon's Negh'var-class. Its hull was reconfigured to better house multiple fighter assault wings, including an innovative drop bay, and marine transports. In a startlingly short time, the Excalibur could launch an invasion of a planet or a space installation. By the early 2380s, Starfleet's need for a large deep space explorer was still going unmet and those whose initial idea it was to retrofit the Excalibur, which should have been the simplest solution, were given pause for thought when the problems with the still-young fleet command vessel were highlighted. It was undoubtedly a good all round vessel. Not all of its non-combat oriented technology had been removed and it was able to fill a multi-purpose role quite adequately. However, many Federation starships could boast the same. The only arena in which the Excalibur excelled, despite its vast size, was battle. Moreover, the ship had structural problems. The hull, originally intended to be significantly larger, had been specifically redesigned to suit a smaller ship, but the Excalibur's unique profile still caused problems. Too much was being asked of it and, despite the foresight to build massive structural supports akin to those found aboard the Galaxy, the Excalibur's hull required levels of maintenance that were disproportionately high compared with its youthful age. Its overly powerful impulse engines, for example, placed considerable strain on the saucer section. Elsewhere, its tactical systems drew a lot of power. While the warp core and power transfer systems were up to this task, they were sometimes overtaxed when engaged in combat for protracted periods and were difficult to repair when damaged. Hence, when the viability of a large deep space explorer was reconsidered, the simple option - retrofitting the Excalibur - was not entertained for long. Instead, Starfleet Command opted for a redesigned Excalibur. The Century-class, as it soon became known, shared many of the Excalibur's design details, but the most obvious and immediate difference between the two was the hull shape. While their configurations were basically the same, the Century's hull followed in the footsteps of the Intrepid and the Sovereign and was streamlined for high-warp performance. While some of this not insignificant alteration was achieved through new construction techniques that were later retroactively applied to Excalibur-class vessels when they berthed for refits, it was primarily possible because the Century was smaller, both in dimensions and mass, than its sister ship. Therefore, a large number of the structural problems afflicting the forerunner were immediately sidelined, allowing the design and construction teams to focus on the Century's other aspects. The Century's impulse engines, while availing of the latest advances in technology, were several times smaller than the Excalibur's. This avoided the compression problems experienced by the larger ship, but it meant that the Excalibur's maximum sub-light speed was markedly inferior. Not even the addition of a third, central engine during the design process' early stages made a significant difference, although the relocation of the two existing engines to the nacelle pylons, which could easily stand up under the strain of the smaller drive units, boosted the Century's manoeuvrability somewhat. In Starfleet Command's eyes, however, the overall loss when compared with the Excalibur was virtually inconsequential. The Century, after all, was not intended to be a combat vessel and, for the most part, its impulse engines would not be called upon as frequently as the Excalibur's, which would typically not be free to flee an engagement area at warp. The Century's phaser arrays numbered only half of that of the Excalibur's. Although they were of the same type and could muster near identical outputs, the reduction not only meant that the Century's power distribution networks would not need to be overly complicated and numerous and, as such, open to failure or damage, but that more of the ship's power output would, in the normal course of events, be devoted to its scientific systems. Likewise, the Century's shields, while advanced, were not as strong as the Excalibur's. Indeed, the shortfall was as much as 15% when amplification through additional power transfers was not required in emergency situations. The Century could not boast as many fighter launch bays or staging areas, and its communications systems, while advanced, could not compare with those found aboard the combat-oriented Excalibur. In keeping with the desire for a vessel of peaceful exploration, the Century lacked its sister ship's three quantum torpedo turrets. Essentially, the Excalibur's military components had been considerably scaled back to make room for the re-inclusion of scientific equipment. Using the latest and most advanced systems, from long-range multi-spectral sensors and quantum distortion spatial probes to poly-state laboratory scanners and adapted tri-deflector interference generators, the Century surpassed the exploratory capabilities of the Galaxy, the Nebula and the Excalibur. In addition, room was made aboard the large ship for families. For several decades, where deep space or long duration missions were concerned, Starfleet had been attempting to see to its personnel's social and communal needs by providing living areas for their families. In the 2350s, the Galaxy had been purposely designed to administer this policy and other designs had been modified to better accommodate non-Starfleet personnel. The Century could boast school rooms and play areas for children and recreational areas of many varieties, including holodecks. Many areas on board the Century could be converted for specific uses as the mission went on, although some were deliberately engineered to suit the most commonly envisaged scenarios - hydroponics, arboreta, testing ranges, storage bays, additional labs or extra quarters (for newborns, etc.) - better than others. Given the Century's exploratory nature, luxurious accommodation was built for visiting dignitaries and one of the most powerful computers ever to be in service aboard a Federation starship was installed. Despite this modern outlook, it was not decided to employ the quantum slipstream drive now being developed into new Starfleet classes, due to the minimal quantity of benamite crystals in the galaxy (despite the ability to recrystallise them) and the impractical design of the Century-class hull. However, the Century Class Starship Development Project was halted in 2381 with the sudden and dramatic Borg Invasion, which led to the destruction of many of the Federation's construction yards, as well as a general halting of starship development, with resources becoming so scarce. The resolution of the conflict left Starfleet with forty percent less vessels, and the need for a rebuilt fleet was obvious. Although many in Command were arguing that vessels focused on tactical systems should be constructed, in lieu of the new Typhon Pact threat, it was generally agreed that Starfleet needed to return to an image of peaceful exploration, whilst also maintaining a level playing field with their Cold War opponents. Once again, the Century Class Starship Development Project was activated, but this time with a focus on upgraded tactical systems alongside the scientific ones, with improved intelligence-gathering sensors, and a greater ability to serve as a flag command ship and powerful tank in battle, should the need ever arise. This decision led to many of the scientific systems in the original plan being stripped out or re-devoted to amplify tactical capabilities. Equally, a more competent computer system was introduced into the vessel class, creating a hybrid system that was part bioneural, part isolinear, good at both data handling and pattern recognition, and combined into a core easily capable of outperforming an Intrepid-class starship of the previous decade. Impressive though this is for such a small ship, the real advances were in the network engineering. The Century computer core can easily and quickly be linked up to four others, creating a super-core sixteen times more powerful that forms the main computer systems on other similar classes, with computing power greater than that of the Sovereign-class. Once again, these super-cores can be linked together, with six super-cores forming the main computer of a Century-class starship. Their combined computing power is almost thirty six times greater than that of a Galaxy class, giving the Century-class far and away the most powerful computer ever equipped to a mobile platform, leading it to be the perfect example of a fleet capital ship, as well as a long-distance, self-reliant starship or intelligence-gathering battle-ready platform. The Century-class ships feature revolutionary new warp nacelles. Each nacelle features 26 primary warp coils, and 48 secondary warp coils in four banks of twelve. The primary coils are not themselves greatly advanced over those of the previous generation of ships, but the secondary coils allow a far greater degree of control over the warp field. In this way it is possible to stabilise warp fields at very high velocities where they would otherwise become turbulent and dissipate. In addition, they are capable of generating significant off-axis components that make the Century line an order of magnitude more manoeuvrable at warp velocities, with vastly increased acceleration in all directions. The Century-class ships are therefore capable of extremely high velocities, and of reaching them faster than any ship before them. They are fully capable of cruising at warp 9.99 for extended periods of time, and capable of reaching warp 9.999 without damage. However, any ship accelerating through this limit will begin to experience design tremours; the hull has been designed to resonate in warning when the design tollerances are in danger of being breached. A final failsafe tremor at warp 9.9994 will be violent enough to cause the secondary coils to fail, leading to destabilisation of the warp field and an emergency return to sublight. The damage to the secondary coils in at this velocity is planned. This is because whilst the Century-class warp drives are theoretically capable of exceeding warp 9.9994, the hulls are not strong enough and are in danger of immediate implosion at this velocity. A controlled failure of the warp drive was preferable to a ship being lost with all hands and scattered over four sectors. The Secondary Coils are designed so that they fail in a certain, easily repairable manner, and the ships are still capable of warp 9.99 on the Primary coils should it become neccessary to engage the drive again before repairs are complete. Naturally performance will suffer whilst the secondary coils are offline, and they cannot be serviced whilst the primary coils are in operation, but it only takes four crewmen half an hour to make the repairs to each coil, and full functionality can be restored by a team of 16 in 12 hours, whereas in previous classes, unsafe velocities could cause serious permanent damage that could only be repaired by a drydock facility. In early 2385, the first Century-class starship, the class' namesake, launched on her shakedown trial for a grand tour of the Federation's borders. During the opening months of the tour, the Century needed to modify its course to make use of the local starbases' docking and maintenance facilities five times due to problems with its power generation systems. On one occasion, another starship had to divert to rendezvous with the Century when the prototype's warp engines, stricken by an inexplicable power surge, failed. The modifications ordered and overseen by the experienced engineers aboard the other Starfleet vessel spelled the end of the Century's burgeoning power problems and, for the remaining year and a half of the shakedown cruise and testing, the ship never needed to visit another starbase or meet with another vessel again. In late 2386, the USS Century was commissioned NX-87700 and immediately set out for beyond Gorn space, partly as a show of might and power to the Typhon Pact. Three other vessels of the class began construction in earnest. The Century, what the Excalibur should have been but on a reduced scale, is a peaceful explorer, but the armaments are certainly capable of holding their own in a firefight, as well as the defences of the Century being representative of Starfleet's most advanced technologies, utilising leftover technology from the Borg conflicts, such as auto-modulating shielding, and the commonly-used metaphasic and regenerative shielding technology also installed. The ablative armour of the Defiant and Prometheus-classes was also introduced to the class, becoming increasingly utilised in the rebuilding Starfleet. By 2388, the USS Liberty Belle NCC-87921 was launched as yet another of this esteemed class in a grouping of a further two vessels, the USS Borough NCC-87923 and the USS Eagle NCC-956-C. This second generation was fully capable of saucer separation, unlike its forebears, as more and more Starfleet vessels employed the tactic. In dire situations, it has shown itself to be an invaluable tool, not only to save lives, but also in tactical scenarios, boasting six rapid-fire torpedo launchers capable of firing six torpedoes every second.